A normal BMI level is 18.5 -24.9. Obese people suffer an orthopaedic injury 48% more frequently than a person with an normal BMI. Total knee replacements are needed nearly 10x greater frequency in people with a BMI that measures 30 and higher. People with a BMI of 40 or higher will often times be advised to lose weight prior to having a non-life threatening surgery performed. Seek the advice of a Physical Therapist if you desire to learn a proper exercise routine to perform to aid in weight reduction. On a global scale, more people are obese than are underweight. More people die from being overweight or obese than being underweight. This additional weight causes of range of physical and emotional problems, resulting in more health related expenses across a lifetime. This worldwide epidemic not only impacts individuals but places an overwhelming strain upon the healthcare system. One aspect of being overweight or obese that has not been well publicized is the increased occurrence of orthopaedic conditions that can be directly linked to excess body weight. Orthopaedic problems include any condition that is associated with the musculoskeletal system. The bones, joints and soft tissues of the body are under a great deal more stress and strain when body weight increases. The body has to be able to withstand compressive and sheer forces to be able to safely perform all of its functions without incurring an injury. When these forces are too great, damage to a part of the musculoskeletal system occurs. Excess body weight and being obese places a tremendous amount of strain on every part of the person’s body. Body Mass Index, or BMI, has been the barometer that is used to determine if a person is overweight or obese. Simply stated, BMI is a measure of the amount of body fat based on a person’s height and weight. A BMI of 25 -25.9 is considered overweight and 30 -30.9 is obese. Anything above 30.9 falls into a morbidly or super obese category. Obesity has been linked to a host of health issues including type II diabetes, cardiovascular problems, some types of cancers are more prevalent, low self-esteem, depression, and numerous orthopaedic conditions are linked to excess body weight. Pain: Overweight and obese people are more likely to suffer from a painful body parts and pain conditions such as fibromyalgia. Their joints in the lumbar spine, hips, knees, ankle and feet are under a tremendous load with every step. Their gait is slower with wider stance. This might be for stability or simply because their thighs are too big. This gait places more stress on the joints. 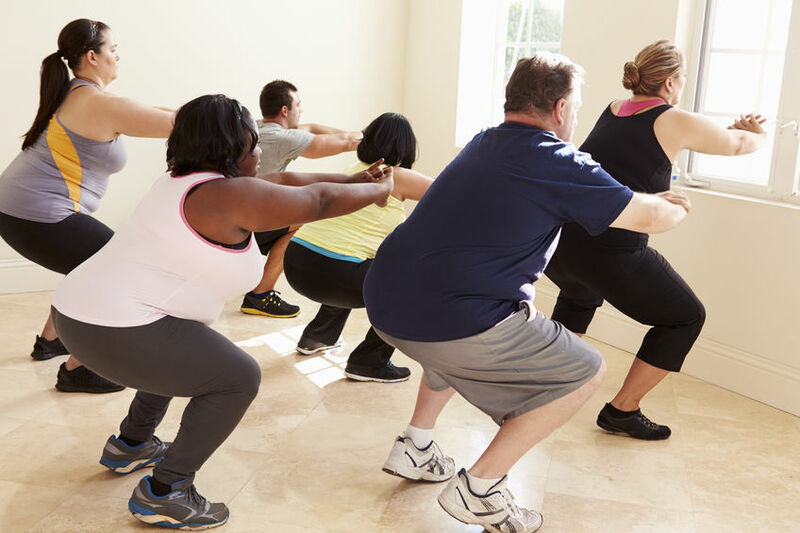 Many times the muscle strength of the overweight or obese person is not sufficient to provide the dynamic support that is required by the body’s joints to function safely and properly to avoid an injury. Obesity nearly doubles the chances of someone suffering from a chronic pain in a specific body part or generally throughout the musculoskeletal system compared to the “normal” weight individual. Osteoarthritis (OA): OA occurs when the articular cartilage on the ends of the bones wears out due to use and abuse. Part of aging usually includes the development of OA in weight bearing joints. The knee is loaded with 4-6 lbs of pressure for every pound of body weight. The need to replace the knee joint (s) of a person with a BMI of 30 or greater is nearly 10 x as great as the person with a normal BMI (18.5-24.9). Obese children in the US are more likely to suffer from a hip condition that is referred to as slipped capital femoral epiphysis (SCFE) than their normal weight counterparts. More than 85% of the children that suffer from SCFE are obese. Injuries: People that are overweight or obese are more prone to suffering orthopaedic injuries. Some studies reveal an increase incidence rate of nearly 50% greater frequency of injury compared to a normal weight individual. A lack of muscle strength is often associated with a high BMI. People that have an above normal BMI move more slowly, have a slower reaction time and many times do not have the muscle strength to dynamically stabilize their joints. All of these traits can lead to the increased occurrence of musculoskeletal injuries. Healthcare professionals must be more active in their recommendations and advocacy of living a more active lifestyle regardless of age to help control their body mass. Physical Therapists can be advocates of a healthier lifestyle and help every patient transition to a healthier way of life. Education is a must and incorporating some kind of cardiovascular activity into their treatment protocol regardless of their condition could help to motivate that patient and help them initiate that type of activity into their daily routine. Obviously, the patient must be physically able to perform some type of cardiovascular activity but even a moderate “walking” program would be a good start. Being overweight and/or obese can cause many health related conditions that impact quality of life in negative ways. Orthopaedic problems are more prevalent in this population and limit their ability to perform numerous every day activities which hinders their lifestyle. Weight reduction is not easy, but reducing body mass to a normal level empowers people to enjoy a healthier more active life.